There are definitely some foods out there that just don't seem like they could be replicated in your home kitchen, and marshmallows are one of them. What a weird and bizarre food they are! Sweet, soft, squishy, and powdery — it's what I imagined clouds to taste like when I was younger. But truth be told, I don't even like marshmallows. Why bother making them at home? Could a homemade version really be that much better than the store-bought kind? I wasn't convinced, but after flipping through several baking cookbooks with marshmallow recipes, my curiosity began to grow. Because here's the truth: there are some recipes on this blog that I make because I truly enjoy the food; there are others that I make for the challenge of it. This is one of those recipes. Because not only did I want to make marshmallows, I wanted to make flavored marshmallows. 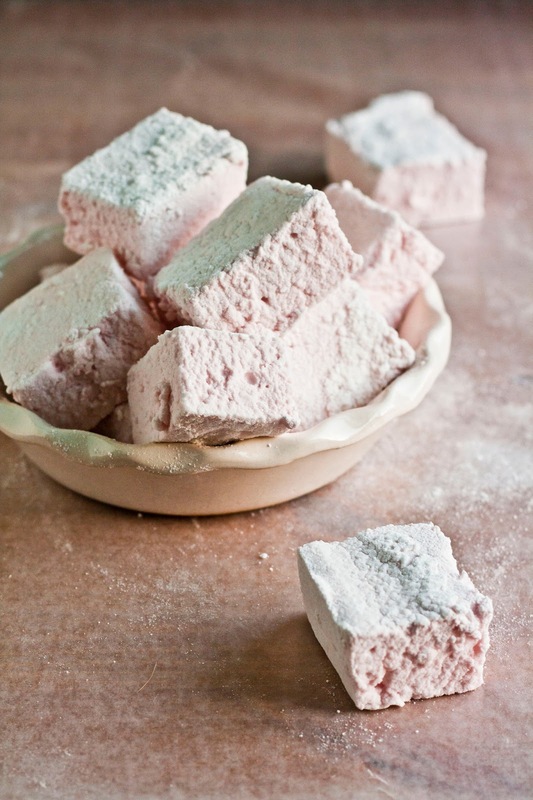 I really don't know how, but somehow I'd gotten stuck on the idea of a rhubarb marshmallow. Doesn't that just sound awesome and friggin' tasty? So after searching the internet for rhubarb marshmallows and failing find any recipes, I decided to take matters into my own hands. Using Miette's vanilla marshmallow recipe as a base, I subbed out the recipe's corn syrup for some homemade rhubarb simple syrup. A ballsy move, considering I had never made marshmallows before and feared that corn syrup and rhubarb syrup were too dissimilar to produce the same results. I'm not going to lie — at first I was a little bit skeptical of my creation. First of all, homemade marshmallows don't look like the pretty, uniformed little cylinders that you get in plastic bags at supermarkets. As you can see from the picture above, my marshmallows were cut in odd-shaped, disparate squares. Also, quick side note for food photographers — it's REALLY hard to take good pictures of homemade marshmallows and just make them look attractive in general. Just FYI. I hate my pictures. There, I said it. However, after my first bite, I realized that homemade marshmallows are a different species of their own entirely. They really are quite different from the jet-puffed marshmallows that you find in the store. 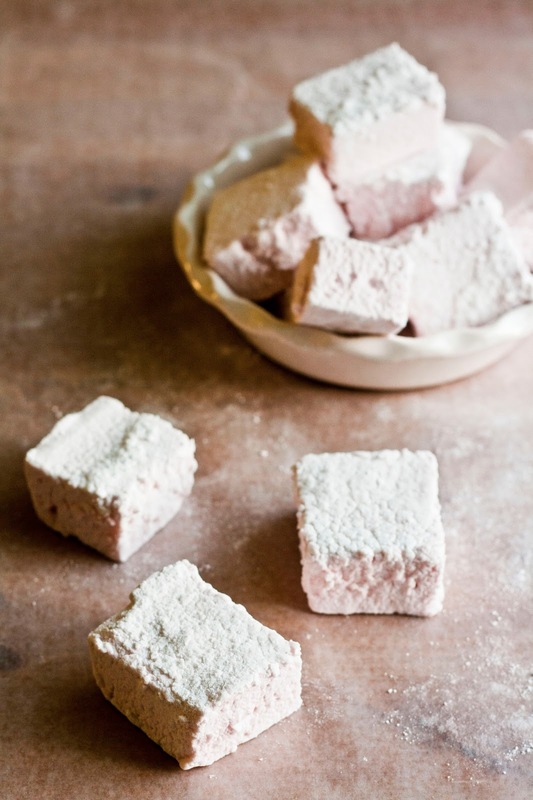 Incredibly light, pillowy, and airy, these homemade marshmallows almost dissolve in your mouth! They reminded me more of a light meringue than anything else — and that makes sense, because it turns out homemade marshmallows are made from nothing but egg whites, gelatin, and sugar. The rhubarb syrup brought the perfect amount of subtle tartness to the sugary marshmallow flavor. My only word of warning is that homemade marshmallows tend to be stickier than the kind you find in the store. I suggest rolling them generously in powdered sugar to prevent them from sticking to each other when storing them away. I also didn't use any artificial food coloring in my marshmallows, so if you want a more vividly colored marshmallow, I suggest throwing in a half teaspoon of food coloring during the whipping process. 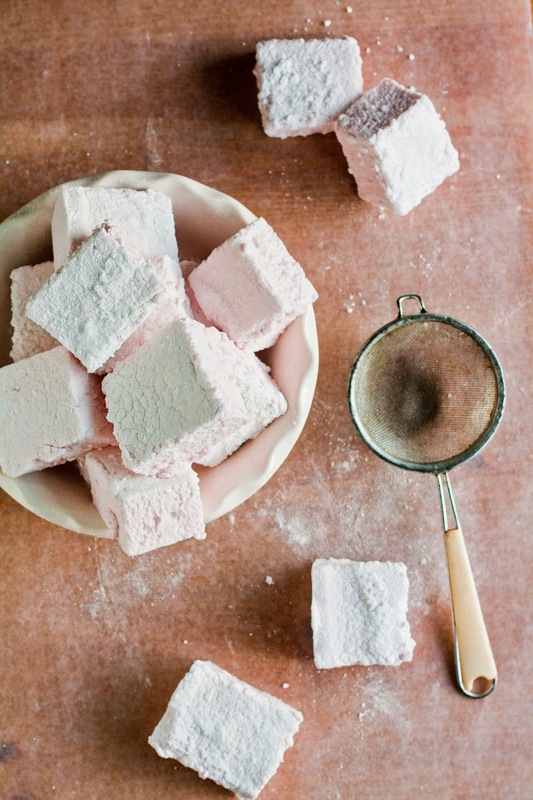 Finally, don't be intimidated by the marshmallow-making process! All the recipe calls for you to do is heat up some things in a pot, and then slowly pour the resulting syrup into some egg whites while they're being whipped. Voila. Homemade marshmallows, just like that. Who woulda thunk? Combine 4 cups fresh rhubarb, 1 cup water, and 1 cup granulated sugar in a heavy-bottomed sauce pan and bring to a boil. Lower the heat to a simmer and cook gently until the fruit is soft and the liquid has thickened, about 40 minutes. You want a really thick liquid here with the consistency of a soup or corn syrup. Once the mixture has reached the consistency of a thick soup/corn syrup, ladle into a fine, mesh strainer (or a coarse strainer lined with cheesecloth) placed over a large, heatproof bowl. Strain until most of the liquid is in the bowl. Give a little press on the solids with a spoon to extract more syrup. You should have about 1/2 cup of syrup. Set aside and allow to cool to room temperature. Prepare a 9 x 13-inch baking pan by lightly coating with cooking spray. In a small bowl, whisk together 1/2 cup cornstarch and 1/2 cup powdered sugar. Dust the bottom and sides of the pan with the cornstarch mixture (it helps to use a pastry brush). Tap off the excess and reserve. In a small bowl, sprinkle 3 tablespoons plus 2 teaspoons (or, 1 oz.) unflavored gelatin over the surface of 1/3 cup water. Whisk together briefly, and set aside to soften. In a medium saucepan, combine 2 cups granulated sugar, 1/2 cup rhubarb syrup (from the recipe above), and 1/2 cup water. Clip a candy thermometer to the side of the pan, and over medium-low heat, cook the mixture to 246 (F). As the mixture approaches 246 (F), it will start to creep up the sides of the pan — simply whisk or remove from heat for a few seconds to prevent the mixture from boiling over. Meanwhile, in the bowl of a stand mixer fitted with a whisk attachment, combine 3 egg whites, 1/2 tablespoon vanilla extract, 1/4 teaspoon kosher salt, and a pinch of cream of tartar. When the syrup (from the third step) reaches 230 (F), start to whisk the egg white mixture in the mixer's lowest speed. Once the syrup mixture reaches 246 (F), immediately remove the syrup from heat and whisk in the softened gelatin (from the second step) until no lumps remain. Pour the syrup through a fine-mesh sieve over a heatproof bowl or large liquid measuring cup. With the mixer still on low speed, pour in a small amount of syrup away from the whisk so that the hot syrup doesn't splash. Continue to add the syrup in a thin stream; when all the syrup has been added, raise the speed to medium-high. Continue to whisk until the meringue has cooled to room temperature and stiff peaks form — this should take about 15 to 20 minutes, depending on your mixer. Once stiff peaks have formed in your meringue, use a rubber spatula to scrape the meringue out into your prepared 9 x 13-inch baking pan and smooth the top. Let rest for an hour uncovered, before covering the pan and allowing the marshmallows to set for approximately 6 hours. Once the marshmallows have set, invert the slab onto a cutting board dusted lightly with the remaining cornstarch and powdered sugar mixture (from the first step). 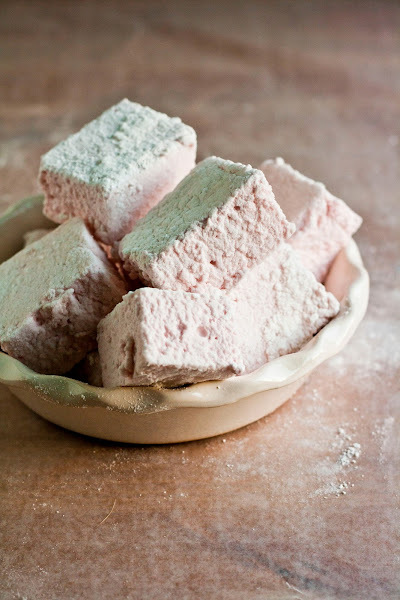 Use a lightly oiled serrated knife to cut the marshmallows into 1 1/2-inch squares Dust the cut edges with the remaining cornstarch mixture and store in an airtight container or bag for up to 5 days. they look great and sound fantastic! every year for Christmas I make peppermint marshmallows and give them out as little gifts. love your rhubarb idea!